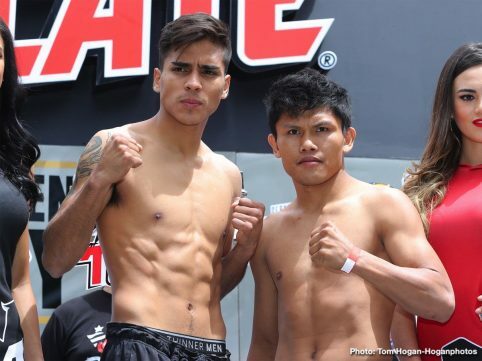 By Aragon Garcia: WBO light middleweight champion Jaime Munguia (32-0, 26 KOs) weighed in at 154 pounds on Friday for his title defense against mandatory Dennis Hogan (28-1-1, 7 KOs) this Saturday night on DAZN at the Arena Monterrey, in Monterrey, Mexico. Hogan, 34, also weighed in at 154 pounds, and looked in great shape. Hogan is a big underdog in this fight, and for good reason. 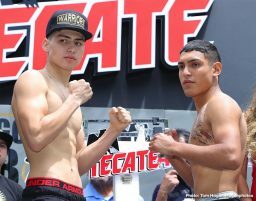 He’s facing one of the best young talents in boxing in 22-year-old Munguia. The Australian based Hogan will give him best, and try and shock the world on Saturday. 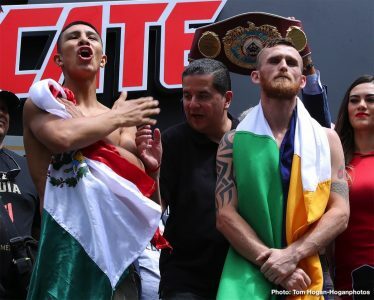 This is another step forward with the superstar in the making Munguia’s career. He’s being groomed for greatness. 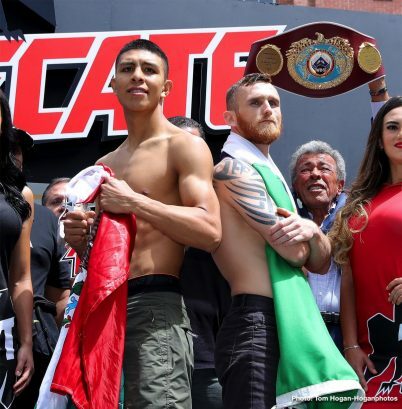 One day in the future, Munguia could be the fighter that replaces Saul Canelo Alvarez as Golden Boy Promotions’ next star. 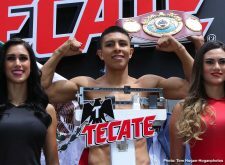 In the meantime, Munguia, 22, needs to take care of business on Saturday night, April 13, in his fourth title defense of his World Boxing Organization 154 lb title against #1 WBO Hogan. “I think more than anything, I’ll keep fighting, and keep getting experience, and then go up to 160 and be in the ranks of Canelo and Golovkin,” Munguia said. “I think with more experience, more work, more maturity, then I think those fights will come in their moment when we’re ready. Well, I think the ones everyone wants is Canelo and Golovkin. 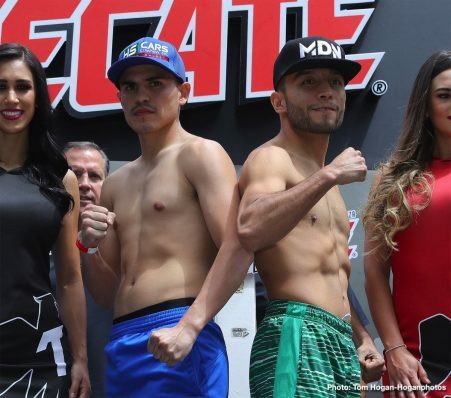 So, I think those are a pair of fights that will happen in the future,” Munguia said. There was originally talk of Munguia moving up to 160 in 2020 to face GGG or Canelo in a big money fight on DAZN, but it now looks like the handlers for Jaime are going to let him slowly get experience before he faces one of them. GGG has a three-year contract with DAZN, which means that if Munguia is going to fight him, he’s likely going to need to do that sometime in the next three years. If Munguia decides he wants to fight Triple G in four to five years from now, he may be too late. “It means a lot to me to be back in Mexico. 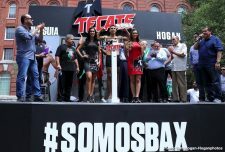 I’m happy to be back in my country,” Munguia said. “This was the last place I fought before winning the world title, so it brings back good memories. I’m excited to bring a good show to the fans that’ll be there on April 13th. 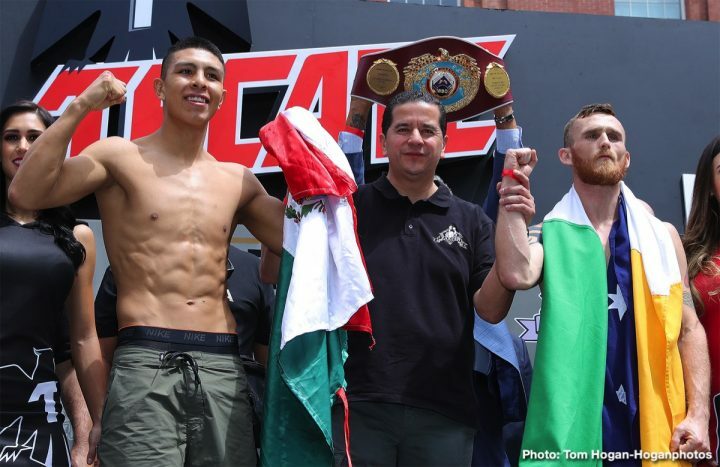 There’s more pressure for me to come out on top, and I come to win,” Munguia said. Munguia’s last three fights have taken place in Las Vegas [x 2] and New York. He captured the WBO 154 lb title last May in stopping Sadam Ali in the fourth round at the Turning Stone Resort & Casino, in Verona, New York. In Munguia’s two title defenses, he’s beaten Liam Smith at the Hard Rock Hotel & Casino and Brandon Cook at the T-Mobile Arena in Las Vegas. 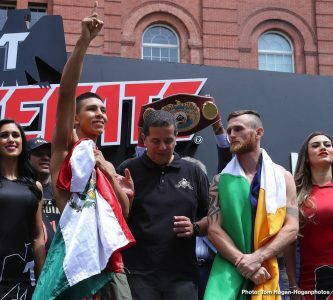 “I think that maybe just for the remainder of the year,” Munguia said about him moving up to 160 after 2019. “Now it’s a bit of work to get to 154. 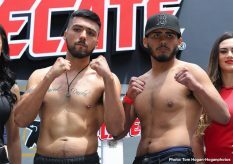 I’m already very big for the weight class, but with care and the necessary maintenance, I think I can do it,” Munguia said. Hogan’s body language looked poor at the weigh-in. He has the appearance of someone that looks like he’s already lost the fight. Hogan seems to know what he’s up against in being the underdog, and he doesn’t have the right motivated look that a challenger needs for him to have a shot at winning this fight. 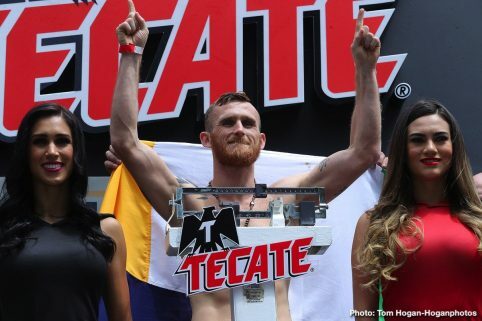 Hopefully, Hogan gives his best, and doesn’t come out flat, because he’s going to need to be firing on all eight cylinders for him to have a shot at winning the fight against the bigger, stronger and younger Munguia.